Maid of Secrets was a lot of fun! I know that based on the description, a lot of people would think it wouldn't be fun. Why not intriguing? Or thrilling? Beautifully written, fast paced or thought provoking? And the truth is this novel is all of those things. But first and foremost it is fun. And I don't mean in a laugh-out-loud kind of way. I mean in a scary, awesome roller coaster kind of way. There is heart-pounding, action, interesting dialogue, quirky characters make this so enjoyable and not to heavy even though the book has quite a handful of pages! Meg was a very good protagonist she had a strong but at the same time unsure voice and developed beautifully throughout the book. She is not quite sure where she belongs, if anywhere, but she has some killer spy traits. (Actual maybe not "killer". That's Jane!) Anyways, Meg can do perfect mimicry. Isn't that insane? This also makes Meg unsure of who she is though. Is she an independent person or just a copycat that can be anybody but herself? The other characters all have cool traits to. They are able to see the future, assassins, really smart, or kind of manipulative. Sophia, Jane, Beatrice, Anna , and Meg make a perfect group. Although they were introduced weirdly and untimely. Actually, the whole introduction was kind of off-putting, just whizzing through scene after scene which were months apart in the first 30 pages. That is my only complaint though, so readers, just get through the intro! The romance in the book was fun, although we didn't dwell on it. Mostly we are talking about conspiracies against the queen. These parts were fun, entertaining and interesting. I definitely loved all the plots and the author's take on how the queen acted. I am still not sure if I like the queen, although I definitely admire her. She has guts! She endures insults, proposals, gossip, plots and still manages the entirety of England on her own. 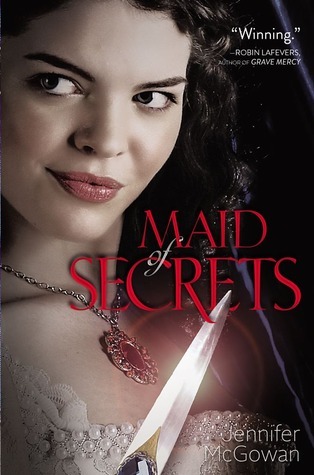 Overall, I really enjoyed Maids of Secrets. This is recommended to anyone who wants a fun, interesting read, with memorable characters. I read this book a couple of weeks ago and loved it! It was my first historical fiction novel. I liked the whole premise of a secret group of spies working for the Queen. I love conspiracy theories and this book definitely kept my attention! I'm glad the romance didn't become this huge plot consumer. I thought it added an interesting twist to the story but the mystery of the threats held my full attention, and that's what I wanted to know more about! It seems like these days some authors start off with a cool story line but then once a romance is thrown in, that becomes the main focus. Jennifer McGowan kept the focus on the conspiracies and I love her for it. Happy to see you enjoyed this, too! I know, Maid of Secrets was great! Good to know I need to get through the first 30 pages. I just got this in the mail today. I can't wait to start. I have been wanting some fun reads. Maid of Secrets sounds SO good. I love that there's the whole spy element and that the romance isn't the focus.